Alamogordo is a small New Mexico town of just over 30,000, situated in the Tularosa Basin of the Chihuahuan Desert. Bordered in the east by the Sacramento Mountains and to the west by White Sands National Monument, it fills the role of county seat for Otero County. Last week, Aftermath representatives traveled to New Mexico to present the grant and to meet the faces (and paws) behind the badge. 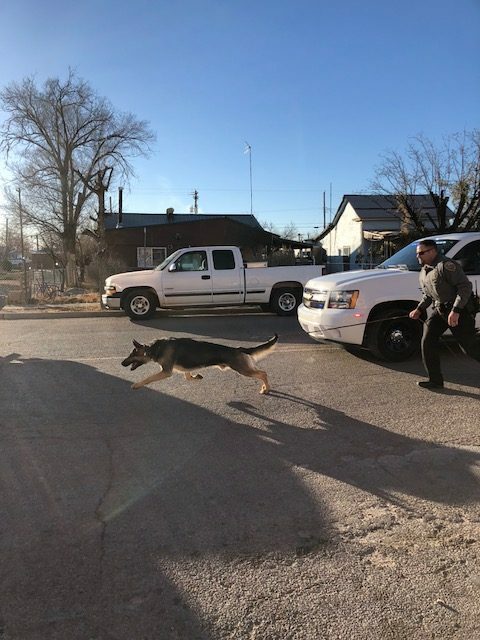 For the second year in a row, the Alamogordo Police Department earned a spot among the Top Dogs in Aftermath’s 2017 K9 Grant. In the past year, the department placed second in the annual Grant Competition, winning another $4,000 for the city’s K9 program (the department took 1st place in 2016). Accepting this year’s grant was Alamogordo’s Acting Police Chief, Roger Schoolcraft. Since first receiving a K9 Grant in November of 2016, the Alamogordo K9 Unit has grown exponentially. When Aftermath first became acquainted with the department, they were in the process of training their very first dog, Brutus/Clint. The team has since grown to include Moika, who is almost 3 years old, and Covi, who is 2 and the newest member of the Alamogordo Unit. Brutus is still the youngest dog in the unit, clocking in at a playful and energetic 18 months. Covi and Moika were both trained at the Little Rock K9 Academy, while K9 Clint was trained in the Albuquerque Training Academy. Money from the grant will largely be used to continue the training and maintenance of the K9 program, it will also be used to start a replacement program as the current K9s get older. For the people of Alamogordo, the APD K9 Program will always be a memory and a legacy for Officer Clint Corvinus, whose goal was to create a unit in Alamogordo. Officer Corvinus was killed in the line of duty in 2016, before his dreams could be realized. Before his death, Corvinus put in the initial footwork and began raising money for the cause because he believed strongly in the role of K9s in law enforcement. You can read more about Clint’s legacy on his memorial page. Since establishing the K9 program, Alamogordo has already seen successes in both narcotics and suspect apprehension. Both the Otero County Sheriff’s Office and the State Police can request K9 services and Alamogordo will respond. Moika has already nabbed 5 criminals alone! Chief Schoolcraft states that the presence of the K9s has also made a difference in the community. “Citizens feel safer knowing that these fantastic animals are out on patrol and have their backs. K9s are highly effective and persuasive against those who may cause harm to civilians as well as the officers themselves.”. 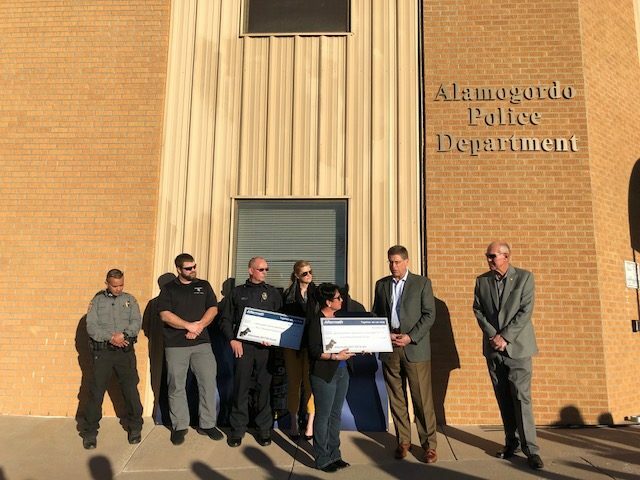 In addition to presenting the K9 Grant, Aftermath also awarded a $1,000 grant to the Otero County Law Enforcement Appreciation Committee for all of the fantastic work that the committee has done to support not only law enforcement but also their spouses and children. The money will be given out as college and daycare scholarships during the Annual Banquet held on May 5th. The award was accepted by Committee Chair Rocky Galassini. You can read more about the LEAC on our recent blog. Congratulations once again to Alamogordo PD and to all the rest of the 2017 K9 Grant Winners! And special thanks to Rocky and LEAC for their hospitality, and for their efforts to support the law enforcement community of Otero County and beyond.